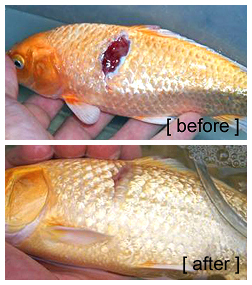 Neocide 3 - A breakthrough in the treatment of Ulcer Disease in Koi. User assumes all risks for proper use of Neocide 3.
and is ineffective against fungus or Mycrobacterium spp. parameters in tank daily. Avoid overcrowding. ©2005 - 2019 Neocide. All rights reserved worldwide.